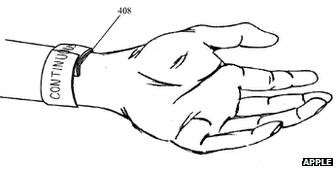 Fresh evidence that Apple has been working on a smart watch concept since at least 2011 has emerged in a patent filing. The document describes a flexible touchscreen display which would communicate with a smartphone or other electronic device. It coincides with a report from a tech consultancy suggesting there is huge pent up demand for such a gadget. But ABI Research warns that battery life issues still need to be addressed. It says assuming such problems can be resolved, about 485 million wearable computing devices might ship by 2018, providing a significant growth opportunity for Apple and the wider consumer electronics industry. Not all published patents lead to actual products, but Bloomberg, the Wall Street Journal and the New York Times have all published reports this month saying sources had confirmed Apple was experimenting with a watch-like device. The iPhone-maker declined to comment when contacted by the BBC. The US Patent Office only revealed Apple’s filing on Thursday, but the document dates back to August 2011. The mooted device is likened to a “slap wrap” – a thin strip of metal covered in fabric which snapped around the user’s wrist to form a bracelet. The toy was popular with teenagers in the late-1980s, but fell out of favour after complaints that it lost its ability to retain its shape over time,. There were also complaints that some users had experienced injuries after the fabric wore away to reveal a sharp metal edge. Apple puts a hi-tech spin on the idea proposing a “slap bracelet” featuring a flexible circuit board and display, a touch sensitive user interface and a two-way communication chip, which would curl around the user’s skin. It suggests the gadget could detect which part of its surface was covered so that its readout would be limited to the exposed screen, with information flowing over the join. Apple suggests lights along the device’s edge could be programmed to blink when the user receives an alert, before displaying the details on its screen. It says the user could then provide a brief response or use the bracelet to command a wirelessly connected smartphone, tablet or laptop to carry out another function such as adjusting the order of a song playlist or reviewing what recent calls had been made. Apple acknowledges that the relatively thin nature of a wrist band would limit its uses, but suggests a wider armband could also be developed. “At the width of a few inches the display can function to temporarily view and manipulate the screen of the portable device it is in communication with,” says the paper. “This might be desirable when the portable electronic device is stored in an inconvenient location such as a cargo pocket, or the bottom of a backpack. For the time being, however, it says the sector is dominated instead by activity trackers – such as Nike’s Fuelband and the Garmin Forerunner – which account for an estimated 61% of the wearable tech market. Some of these devices do tell the time, but they only offer limited functionality beyond monitoring exercise or the owner’s sleep pattern. The consultants instead suggest a much wider range of uses giving the example of linking the watch to a home automation system so that “a quick shake of your wrist can turn off/on room lights”. The idea of a smartwatch has been around for years – but the firm says technology only recently caught up with our imagination. “Moore’s law has driven silicon to the point where it’s small enough and powerful enough to drive applications that mean things to consumers,” ABI’s chief research officer, Stuart Carlaw, told the BBC. “Bluetooth Smart has also brought us high-bandwidth, low-energy connectivity at a less than a dollar a chip and takes up little space while offering robust performance. Apple’s patent confirms the company is aware of the problem. It suggests harvesting energy from the movement of the user’s arms and only coming out of standby mode when a sensor detects the device has been rotated to face a certain way. It adds that the use of an AMOLED (active matrix light emitting diode) display would also help since it can allow individual pixels to be turned off, allowing the watch to only activate the parts which are facing the owner’s eyes.